Today I recommend you one day tour to Mt Huashan, where you can see gorgeous natural scenery and experience its steepness and grandness. Mt Huashan is one of the best hiking places in China, and its pure majesty wins itself tides of praises. Hikers and tourists love to visit this mountain, and are proud of having a climbing in here. Mount Huashan, listed as one of top 5 famous mountains in China, is famous its steepness and beautiful scenery. It is located in Huaying, Shannxi, 120 kilometers away from Xi’an. In the past, it was regarded as one of the sacred places to Taoism, and on the mountain, you may see some Taoism temples. Mount Huashan has five main peaks, north peak, west peak, middle peak, south peak and east peak, and each peak has many attractions and buildngs. 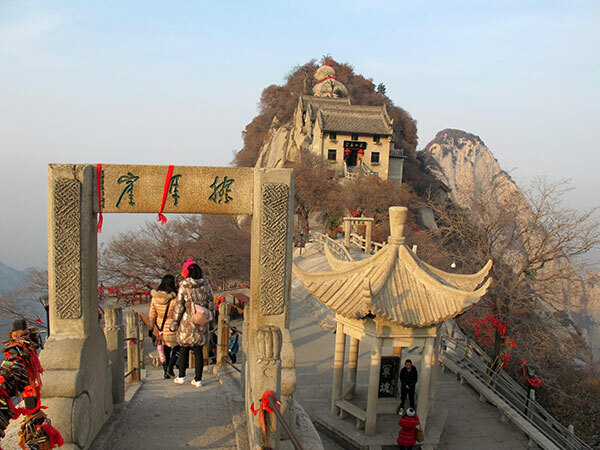 North peak has an altitude of 1614 meters, and a Taoism temple. West peak in the west side is 2082.6 meters high, and it is the perfect to see sunset. South peak is the highest peak with an altitude of 2154.9 meters. East peak is the popular place to watch sunrise, and has an elevation of 2096.2 meters. For more information, please visit Mount Huashan. For more information, please visit Mount Huashan. Mount Huashan Hike: there are iron chains in the two sides of Mount Huashan stairs to keep your safety, if you are a bit tired, you may use them to help you. Still there are enough lights in night for tourists’ night climbing, so you shouldn’t be worried about this, but the scenery in night is most covered by dark. 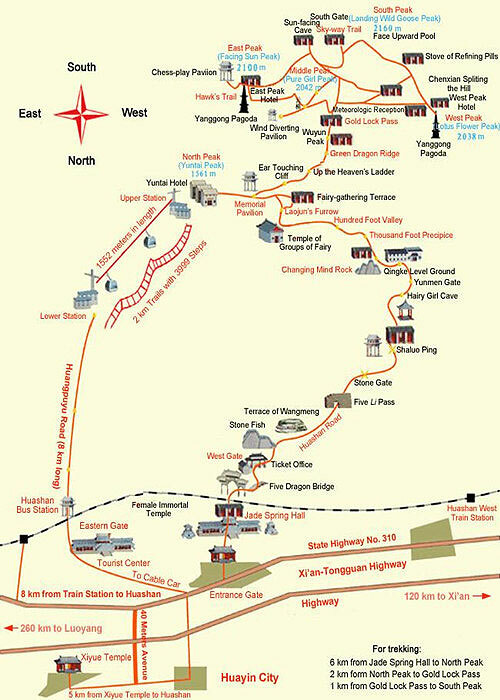 Mount Huashan Map: take a photo of tourist map near the ticket office, so you will know where you are while climbing. Sport shoes: wear a pair of sport shoes, and prepare gloves. There are so many stairs waiting for you to conquer them, and comfortable shoes and cloths may help you save some energy, and protect you. Clothes: if you go to Mount Huashan in winter season, please prepare some warm clothes. If you want to have a night climbing and see sunrise, prepare yourself warm clothes, because it can be cold in night on the mountain top even in summer hot days. Food: bring some high calorie food to supply your energy and several bottles of water, considering you may walk for several hours. No smoking: smoking is forbidden, please control yourself, and you may prepare some candies. Be careful: while you are walking, please be careful and don’t fall down. For more information, please visit Mount Huashan Travel Tips. Take an airport shuttle bus to Xi’an Railway Station, then take a train from Xi’an Railway Station to Huashanbei Railway Station. Last you take a free bus or a taxi to Huashan scenic area. By train: take a high speed train from Xi’anbei Railway Station to Huashanbei Railway Station. About 30 minutes. Ticket fare for a first class seat is 54.5 yuan, second class seat-89.5 yuan, business class seat-175.5 yuan. The earliest train starts at 06:26, and ends at about 20:00. Then take a taxi from Huashanbei Railway Station to Huashan tourist center, which costs about 15 yuan. Or you may take a free bus from Huashanbei Railway Station to Huashan, and it takes about 15 minutes. By long distance bus: take a long distance bus from Xi’an Chengdong bus station to Huayin. About 2 hours, and 28 yuan per person. The bus starts at 07:00, and then every half hour, and ends at 19:15 in off season, while it starts at 06:00, and then every half hour, and ends at 19:15 in peak season. By tour bus: take the tour bus at 08:00 from east square, Xi’an Railway Station, about 2 hours and 22 yuan per person. There is only one tour bus which starts at 08:00 only, and goes back to Xi’an at 17:00. Option 1: have a night climbing at about 23:00 to East Peak, and watch sunrise at about 05:00. Or you may climb the East Peak in the daytime, and book a hotel on the top. After the sunrise, you go to South Peak, West Peak, Middle Peak and then to North Peak one by one, and go down from North Peak by cable car. After the journey, it is about 11 o’clock. Option 2: you may climb Mount Huashan in the morning, and the whole journey is completed by walking from West Peak to North Peak, or from North Peak to West Peak. This way costs much time, about 8 hours, and energy, suitable for hikers and people in good condition. Option 3: you climb Mount Huashan in the morning and take a tour bus from tourist center to the foot of North Peak. Take a cable car to the mountain side of North peak, then from North Peak to East Peak, South Peak, Middle Peak and then West Peak, and go down from West Peak by cable car. Or you take a tour bus to West Peak, South Peak, East Peak, Middle Peak and North Peak and go down from North Peak by cable car. In the end, you take a tour bus back to the exit. This option may take about 6 -7 hours. I recommend you to take option 3, which saves you energy and time, and also give you splendid natural scenery of Mount Huashan, and also a climbing to experience its steepness, but it may cost you more money because of cable fare.